Young leg-spinner Rahul Sharma tells our correspondent Manu Shankar that he is proud that his name is name is being taken alongside Harbhajan Singh, ShaneWarne and Muttiah Muralitharan. When the Indian selectors sat down to pick the One-Day and Twenty20 teams for the upcoming tour of the West Indies, all of them must have had one name on their shortlist. That of an unassuming leg-spinner who outshone the likes of the wily Shane Warne, the experienced Muttiah Muralitharan, Piyush Chawla, Amit Mishra and other leading names in the business of spin in the ongoing fourth edition of the Indian Premier League. Although he wasn't amongst the 16 who will be on the flight to the Caribbean islands next month, Rahul Sharma had done enough to make those who matter in Indian cricket sit up and take note of. "I'm a bit disappointed, as I was hoping to get selected. But it hasn't affected my motivation. I will try and work harder and give my hundred per cent whenever I play," Sharma told rediff.com immediately after India's squad was announced on Friday, May 13. Twenty20 is not the ideal breeding ground for spinners. But, considering the big bats, shorter boundaries and a set of players, who are looking to smoke the bowler out of the park each time you bowl, Sharma has done exceptionally well while turning out for Pune Warriors. An economy rate of 5.33 and 16 wickets from 12 games thus far in IPL-4, comprehend the fact that the Jalandhar lad is one of the finds of this season's T20 extravaganza. Starting off as a 13-year-old pacer who could bat a bit, Sharma soon realized that he had the ability to beat batsmen off the pitch. "I started off as a pacer who could bat a bit. But my coach, Tony Lamba, saw me spinning the ball and asked me pursue leg-spin, as I could beat the batsmen off the pitch," he revealed. "I used to play a lot of gully cricket and my friends would say that I should go for trials. That's when I decided to go for the trials and got selected," he added. He was quick to admit that the early days were tough. "Initially I struggled; there was no one to tell me what to bowl or how to bowl. But I gradually picked up things seeing the seniors on television as well as on the field. "As I improved, I got selected in the under-19 team for the Asia Cup in 2006." His fine performances in the Asia Cup were enough to convince his father to let him pursue the game with passion. "My father wasn't keen on me playing cricket. He always used to say that 'you need a big jack to get into the team'. But with the showing in the Asia Cup I got the support of my father and since then I have never looked back," the 24-year-old recalled. Besides his on-field battles, Sharma also had to contend with off-field issues that almost threatened to cut short his career. "I woke up one morning and felt very numb on the right side. I went for the team practice (then with Deccan Chargers) and that's where the team physio said I have Bell's Palsy. "The doctor advised me complete rest. I was unable to sight the ball properly at first; everything was blurred. 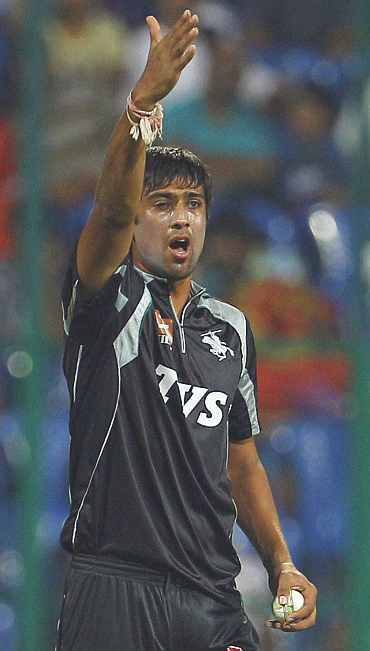 But thanks to the Deccan Chargers' management which took care of everything; now I'm doing pretty well," he informed. So how does it feel to be in the big league now? "Well, it's nice. I mean, my name is being taken alongside Bhajju bhai (Harbhajan Singh), Shane Warne and Murali (Muttiah Muralitharan). It's a big honour!" Sharma attributes his success to his ability to attack the batsman by making him play all the time. "My strength is my accuracy. The fact that I make batsmen play as many balls as possible helps me get wickets," he says. "I'm also working on my variations. During the Rajasthan match I had a word with Warne and he gave tips on how to bowl to different batsmen." Sharma believes the IPL has changed the lives of many young cricketers. "IPL is on television, watched by many, so you get instant recognition for your work. I hope my performances will get me into the Indian team one day." Certainly, that day is not very far. Sharma is already on the shortlist of India's promising spinners. All he now needs is a good showing in the ensuing domestic season.